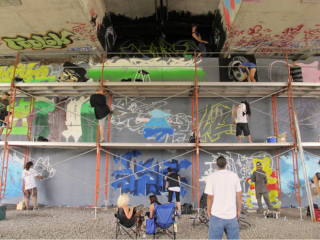 Graffiti is just one of the four elements of hip hop on display at House of Paint. The others — rhyming, DJing, and breakdancing — are also showcased at this annual fest. Launch parties have always been a great way to build hype. That type of event is especially suited to the Twitter age, where many pairs of thumbs can do the work that word of mouth or broadcast media used to do. It’s also a chance to throw it down with the people in your scene. That will be the spirit of things this Friday when the organizers behind the ninth edition of House of Paint gather at Ritual Nightclub to release the lineup for their late-summer festival, which will take place Sept. 13 to 16 beneath the Dunbar Bridge (down from Brewer Park, across from Carleton University) with satellite events taking place throughout the city. The festival celebrates the four elements of hip hop — rhyming, DJing, breakdancing, and graffiti — by showcasing the work of Ottawa artists in those fields. The main event will take place on Saturday, Sept. 15 with an artists’ fair, graffiti installations, DJ and MC battles, breakdancing, and workshops for kids (little ones can learn to write their name graf-style using markers or get a DJing-101 lesson). There will be an art show at the Fall Down Gallery on Bank Street and “capacity-building” workshops with academics from three universities talking about the intersection of urban issues and hip hop. There will also be unannounced “pop-up” breakdance sessions throughout the city. Admission to those events is free. This year, House of Paint organizers are adding a new event. There will be a ticketed concert Sunday, Sept. 16, at the Dunbar Bridge site featuring up-and-comers and royalty of the Canadian hip hop scene. Those names will be announced Friday at the club by MC Atherton, who plans to rhyme the lineup for anyone who wants to click out tweets. At the launch event, there will also be performances by the all-female hip-hop dance troupe called Sick Minds Think Alike, rhyme-sayers Missing Linx, and music by DJ Zattar. House of Paint has been a beloved bookend to festival season for those in the cultural scene since its inception in 2003 by civics geek and community organizer Sabra Ripley. 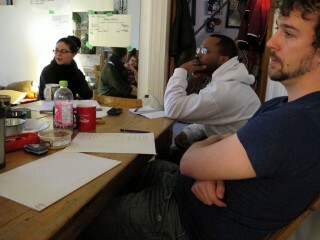 House of Paint organizers meet to talk shop. That mix of business acumen and ground-level cultural connection has always been Ripley’s strong point and has given House of Paint the organizational infrastructure needed to keep it strong. Over the years, Ripley has shored up city funding, assisted in efforts to “green” the festival through safe spray-can disposal, and — just this year — she and her programming team incorporated the festival as a not-for-profit organization, which opens the door to multiple sources of funding. Part of the establishing process involves stickhandling complex GST rules for charities, and gathering a board of directors, which includes U of O criminology prof Deborah Landry, Sandy Hill Community Centre youth outreach worker Gerald Dragon, and architect Sarah Lee. Ripley and her team also held feedback sessions throughout the year with graffers, dancers, and artists to find out how to keep the festival growing. Those sessions helped to stem the worry that all the efforts being spent on the organizational bureaucracy were taking programmers too far away from the community that it represents through House of Paint. The festival’s programming team comprises a crew of artists active in the scene. Ripley is the executive director. Rob Reid of World Famous Music handles promotion and performance files, while DJ Zattar (Alexandre Mattar) programs the music. 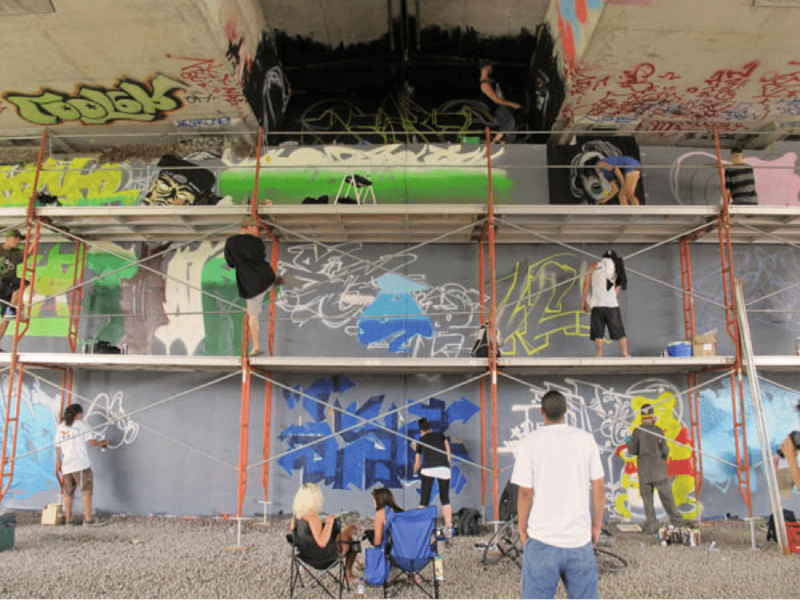 Mike Gall, who works under the handle Mesa, coordinates graffiti artists; Allister Xavier handles the finance; D’janau Morales coordinates dancers; and Kenji Toyooka fields the design aspects of the festival. House of PainT (organizers capitalize the ‘T’ as a play on the band name House of Pain; we didn’t elsewhere in this article because it looks like a typo) Launch party: Friday, July 27, at Ritual Nightclub, 137-1/2 Besserer St. 10 p.m. No cover. Brooklyn singer Sharon Van Etten is an NPR darling. Pitchfork thinks she’s pretty cool too. She’s at Maverick’s Monday with Ottawa indie rock dude Landon A.R. Coleman. 221 Rideau St., 9 p.m., $15. LAL (TO/downtempo/desi-beat) returns to the area to play an outdoor event Friday at SAW Gallery called Summer Nights. Watch the film Double Take (the New York Times calls it “intellectually agile”), and then take in the pop show. There will be chilli and baked beans served on site. Tickets are $5 or $10 if you want to attend a Saturday screening as well. Event takes place at 67 Nicholas St. Full deets at www.summernightsfestival.org. It has nothing to do with music, but it’s too wacky to ignore. On Saturday, July 28, a bunch of drought-stricken folks wearing costumes and armed with dollar-store supersoakers will gather in Dundonald Park on Somerset Street West for a super-duper water fight. Join the game via Facebook.